AutoTonic maps scales to the white notes on your keyboard. With so many applications and plugins handling the melodic and chordal side of music composition for us these days, do really need to even bother making the (considerable) effort to learn the ropes of music theory any more? "I think that a well coded plugin or tool can bridge small gaps in people's music theory knowledge. The gap shouldn't be too huge, otherwise the user can't reach his goal even with a very smart plugin. The user's focus should be to gain music theory knowledge, and some plugins can help with that." "I wanted to know everything I could about music, so I got a four-year degree in music composition, which taught me a lot about theory. The tools of today, I think, aren't very different from, say, CAD programs for architecture - the tools will help you try out ideas, but there's no substitute for having studied architecture. "Since releasing my Cthulhu plugin, I've heard grumblings from people who have 'invested' in studying theory, afraid that Cthulhu has made the fruits of their study available to all for $39. While it's true that Cthulhu can allow an untrained person to mindlessly create something harmonically rich and interesting, the idea wasn't ever to replace traditional music theory - I hoped the opposite: that it would get people more into exploring harmony and thus wanting to grow their theory knowledge." "It's important to understand that the more one knows about music theory, the better equipped they'll be to use these types of software. If you're looking to just implement MIDI effects without learning anything about theory, you'll definitely improve your output, but you'll lack the context on how to really use them. "Tools like our Liquid Notes can assist in creating perfect chord progressions, but it's not a silver bullet - the system is only as good as the input delivered by the user. "There is no right or wrong in music, which gives composers flexibility, but it certainly helps to have a basic understanding of music theory when working with any music software - otherwise, the underlying basics for why the machine takes a certain decision are not understood." "It depends on the specific features of the software, but for AutoTonic, with its patented scale switching technique, I'd say that we're dealing with a whole new kind of instrument. So then the question would be, 'To what extent can a new instrument overcome a lack of music theory knowledge?' 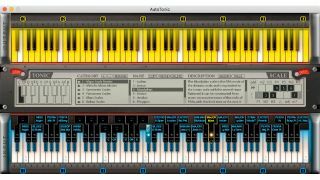 Well, the piano is already one of the easiest instruments, but AutoTonic has made it even easier to use."